This is the third of our blog posts from the Making an Impact workshops we ran in August. Ben Lee (Programme Director, Shared Intelligence) talked about his research into rhyme times and maternal mental health. Last year, Shared Intelligence and Essex County Council conducted research into the impact on maternal mental health of rhyme times which had been modified and also made more consistent. The research was sponsored by Arts Council England. Maternal mental illness is estimated to affect one in five mothers aged 36 or less. Rhyme times in Essex libraries reach 4,000 to 5,000 mothers a year, many of whom attend regularly. This means that each year rhyme times reach around 1,000 mothers experiencing maternal mental health issues. Do rhyme times have a positive effect on maternal mental health and if so, how and why? 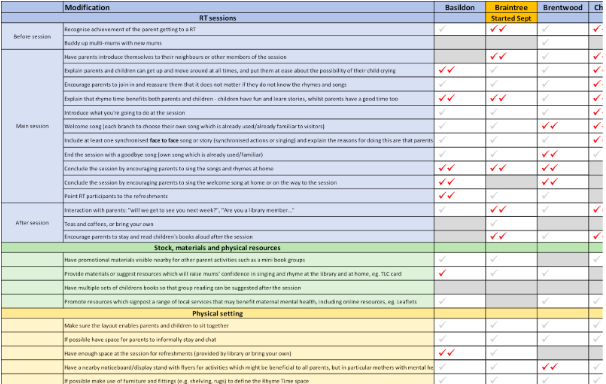 Shared Intelligence started by conducting a literature review which looked at research which mentioned group or individual reading and/or singing with children which could be applied to rhyme times. For example they found that synchronous maternal behaviour (synchronised movement, or vocalisation) is associated with increased dopamine which supports human bonding. In other words when mothers sing or mirror actions with their child (such as face to face), it boosts their mood and helps them bond. Each of the 8 libraries in the research project then picked the modifications which they thought would be useful for them to adopt. The objective here was to modify existing rhyme times, not create a special mental health rhyme time. Shared Intelligence and Essex libraries collected evidence using ‘before and after’ mood charts, change stories and focus groups. Mood charts were used before and after each session; with separate ones for mothers and other carers. This was deemed the least disruptive way of measuring moods, and people are used to providing a response using smiley faces. However the charts did have limitations, in that they were publicly viewed and individuals’ before and after scores could not be linked. In future the report suggested this could be done anonymously by using a tablet or counters in opaque pots. Also Shared Intelligence/Essex didn’t conduct a survey before implementing the modifications. This would be good to do in future before any changes are made to get a baseline. Change stories were from mothers who attended rhyme time regularly during 2017, and who agreed to be interviewed in response to a request from Essex Libraries for women who felt rhyme times had benefited them in some way. Real names were replaced with pseudonyms. The change stories are in the full report. Focus groups were conducted immediately after rhyme time sessions at the libraries with adults who had just taken part. The focus groups were to discover whether, how and why the rhyme times were affecting mother’s mood or mental wellbeing. 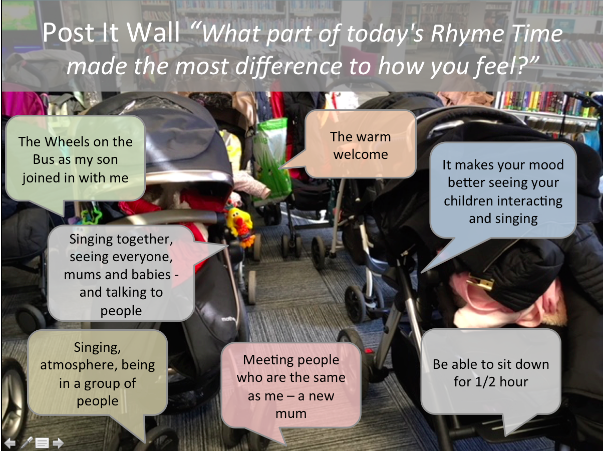 In them participants discussed how rhyme times were affecting their mood and wellbeing, and what specifically it was about the way rhyme times were delivered that contributed to making mothers feel different. Impact: Did rhyme times have a positive effect on maternal mental health? 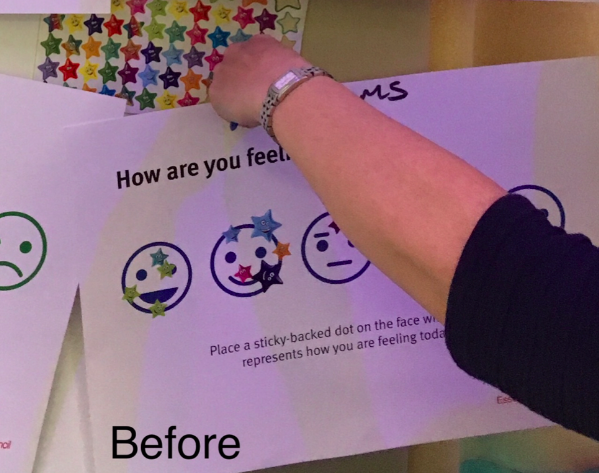 Using the mood charts (taken before and after each session) there is a strong pattern of mothers, upon leaving the modified rhyme time sessions, saying they felt happier than when they arrived. From the focus group discussions 2 specific elements of the sessions stood out as contributing to an improvement in mood in the course of the 30-minute session: the “warm welcome”; seeing their child enjoy themselves; and the act of singing. This was also corroborated in mothers’ Post-It note comments in response to the question What part of today’s rhyme time made the most difference to how you feel? Reach: what was the reach of these activities and can it be increased? Data from sign-in sheets showed that almost three-quarters (72%) of adult carers at rhyme time in the 8 libraries which were part of the project were mothers. In other words, rhyme times have been reaching the audience the project is most interested in. The researchers were also interested in the breakdown between first-time mums and those who already had a child or children, because the evidence is that first-time mothers are less likely to seek help for maternal mental health problems than ‘multi-mums’. First time mothers are also less likely to seek help for mental health support. Here the data shows that three in five (61%) attendees were first-time mothers. In short, rhyme times are effective in reaching mums, and first time mums. The table above shows the Index of Multiple Deprivation (IMD) decile spread of mothers attending rhyme times (rhyme times shown as coloured bars) compared with the IMD spread of all library users in the same catchment areas as the 8 libraries in this research (grey bars). It shows mothers from across all IMD deciles attended the sessions with no notable skewing towards upper or lower deciles. 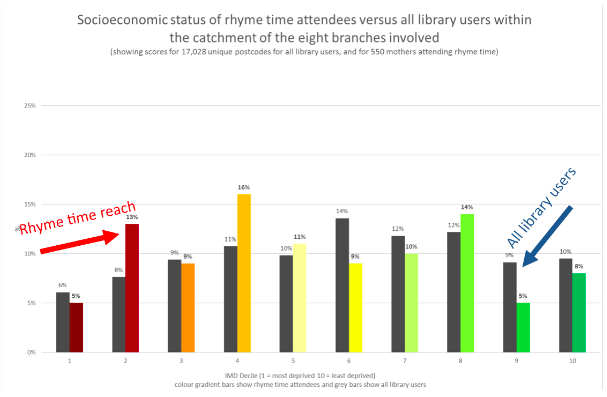 It also shows that among rhyme time mothers there was a slightly higher proportion from postcodes falling in to the second and fourth most deprived deciles, than among users of those same libraries overall. Fidelity: can a more structured approach to rhyme times be implemented consistently in a public library context? Staff were also brought together regularly to discuss problems, and share learning about how to make the modifications more effective. What follow up actions could be taken? consider a bigger piece of research which uses these results as a proof of concept and feasibility study for larger more sophisticated research, or a formal clinical study. You can see the full report here. The project also set up a set of shareable tools for use by other library services looking to learn from or replicate the approach and a quick guide to the research intended for a general audience (including library staff and the public). The slides from Ben's presentation are here. For more information about this project and to be kept in touch with further work on libraries and mental health please contact charlotte.boulton@sharedintelligence.net.